Sometimes, you have to start over to realize just how far you’ve come. Today, I did that with the new Tomb Raider, playing through the first hour or so just two nights after finishing my first playthrough. There was Lara, fresh-faced and wide-eyed, unscarred and unilluminated. Once again, she had no idea what tests awaited her in the hours ahead. I never really played any of the Tomb Raider games. When the original game came out, the blocky 3D graphics reminded of the Dire Straits video for “Money for Nothing.” It didn’t strike me as an adventure game worth having. Years later, I gave Underworld an honest try. I thought things were looking up after dealing with a giant octopus in a sunken ruin, but the game itself soon sank under the weight of seven games worth of lore. It was like showing up at someone else’s family reunion, where everyone was unnervingly attractive and spoke with one eyebrow cocked. 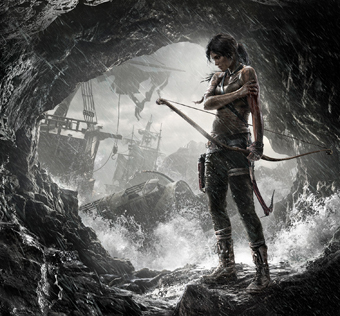 The new Tomb Raider is part reboot and part origin story, recounting Lara’s first adventure after being shipwrecked on an island filled with mystery and bloodthirsty inhabitants. In a post-Lost world, this could have gone either way, but I was surprised at how well-honed the game turned out to be. Despite having a semi-open world – in Batman: Arkham Asylum fashion, the island of Yamatai is a collection of interconnected hubs that can be explored at your own pace – the focus of Tomb Raider is constantly collapsing down to a single narrative point. When I unlocked a new climbing claw, the furthest thing from my mind was going back to that door near the beginning that could now be opened. What I wanted to know was how it would get me to the next big plot moment. It was like riding a landslide, both exhilarating and inexorable. A character’s progression in a videogame can bear certain parallels to the process of initiation, a most ancient method of teaching and testing faith employed by all manner of churches, cults and mystical societies, often resulting in the initiate being ‘reborn’ in a new role or learning a particular secret. The most famous example of such an initiation is that for the third degree of Freemasonry, in which the initiate takes the role of Hiram Abiff, the architect of Solomon’s temple. He is first hoodwinked – not because the blindfold is meant to hide anything, but rather because it induces a certain state of mind – and then he is led through a series of gates. 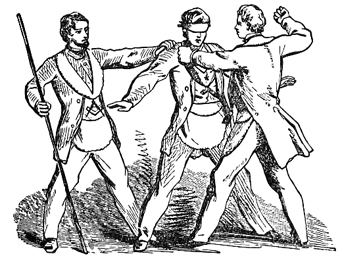 At each gate, a thug asks him to reveal the secrets of Masonry, and when he refuses, the thug strikes him. After three such assaults, the candidate ‘dies’ and after being told the order’s inner secrets, is eventually reborn. Many ancient initiations, like those into the Mysteries of Eleusis and Bacchus of Mycenean Greece, involved symbolic journeys into the underworld. Lara’s travails in the charnel houses of Yamatai, where rotting corpses are strewn as far as the eye can see, can certainly be considered hellish. In most games, the player gradually unlocks new weapons, powers and abilities for their character which in turn allows them to impact the game world in increasingly broad terms, from accessing new areas to altering the environment. Where initiations are meant to open metaphorical doors, character progression in games generally opens physical ones. Tomb Raider opens both. As it develops from a story of survival in a hostile environment into roller coaster pulp adventure, the game builds to an actual revelation. 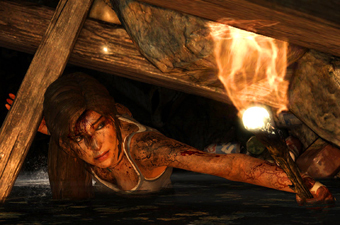 Even the visuals are preparing Lara for a rebirth – it doesn’t seem accidental that sliding down tunnels and crawling through narrow apertures are repeated motifs. For most of the game, the island’s supernatural nature is only hinted at, but when it comes to the fore it tests almost all the characters, from Lara and her fellow shipwreck survivors to Matthias and his cultists. One by one, all but Lara are found wanting. Why Lara? Lara is special. Her father believed in the magic behind the mythology, so perhaps a kind of heredity is at play – the pep talks Lara receives from her mentor Roth boil down to “because you’re a Croft.” On the other hand, Lara is guided by a guardian angel. That old loa, the player, is there when the going gets tough. Early on in the game, Lara grinds to a halt after killing a man, the first human death at her hands. It is an emotional moment that is cut short when other ruffians soon appear and Lara, driven by the player, dispatches them in a series of perfectly placed head shots. How do we reconcile that, if not by divine intervention? 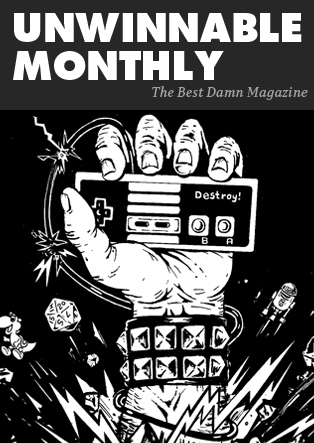 At the end of the game, the only people who survive are the few who had no direct contact with the supernatural or don’t remember their encounter. Only Lara, the illuminated initiate, knows the truth of what happened on Yamatai and, armed with that knowledge, she must go forth into a world that is no longer familiar, to be reborn again and again, in sequel after sequel. That is the hard road of a hero. Stu Horvath is a vicious killer with a silenced pistol, but only when someone else is holding it. Follow him on Twitter @StuHorvath.